Home Re-use-ables has instituted a brand new feature where you can easily identify our goodies shown online. 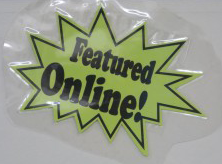 When you see something you like on the website or on Kijiji, come in and look for the “Featured Online” starbursts we attach to our online stars! We like to make it nice and easy for you to find the goods you like and you can be reassured that what you’re looking at in person is indeed the lovely you found online!